The Lego Christmas Sets Make a Great Display - Join the Building Craze! The Christmas Holiday Season can be so much fun for the family with all the decorating and festivities that go with it. The Lego Christmas sets make a great winter holiday display and can be used year after year, just like any other seasonal decorations. This is also a great way to keep the older children involved and interested in setting up the display. The sets that I am reviewing here are from the Lego Creator Expert range and this means that they are suitable for the older children, from 12 years old. The models are not too complicated, but they do include a lot of small pieces. With some help from older siblings or a parent the younger the children would also enjoy these sets. Special items included: a wrapped gift, snowboard, skis, wreaths, 2 sets of string lights, top hats, carol songbooks and toys (a jack-in-the-box, helicopter, rocket, train, race car, truck, robot, tugboat and a teddy bear). A Christmas tree with decorations, a ladder, a bench, an ornate steetlight, a corrot-nosed snowman and a cat. Size: The completed model measures over 6″ (17cm) high, 7″ (19cm wide) and 3″ (10cm) deep. The Christmas tree measures over 5″(15cm) high and 4″ (11cm) diameter. This set contains a lot of small pieces and will take a few hours to build. It is really worth the effort to have this as part of the Christmas display. Special items included: a sleigh with red and gold detail, 4 reindeer, baby reindeer, Christmas tree, 4 wrapped presents, 4 toys (spaceship, yellow car and a pink wand), North Pole sign, Santa’s Workshop sign and a holiday picture of Santa and his wife. The building features a stained glass window and Christmas lights on the roof. Size: The completed model measures over 6″ (16cm) high, 3″ (8cm) deep and 9″ (24cm) wide. Another fun and festive set to add to the Christmas display. As with the other Creator Expert sets this has lots of small and fiddly pieces. Warning: do not throw away anything after opening the box. There are small plastic pieces like the reins for the reindeer that might not look like part of the set. Just keep everything until you have completed the model so that you do not mistakenly throw out something that you need. 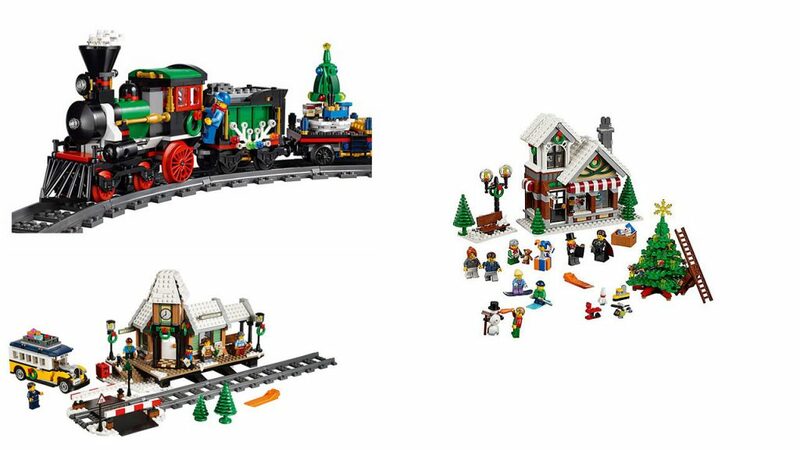 This set goes with the Winter Holiday Train that I mentioned in my review of the Lego Train Sets. It will add some fun and character to the Christmas display, but it really would not be complete without the train to go with it. Special items included: wreath adorned lampposts, clock tower, platform, mailbox, green trees, snowy grade crossing with twin barriers and lights, festively decorated bus with opening doors and a luggage rack with removable luggage and gift wrapped packages. Size: The completed model measures over 7” (19cm) high, 11” (28cm) wide and 5” (14cm) deep. This is also a fun set to build with a lot of detail and small pieces. Even without the train set it will still make a good addition to the display. It is quite difficult to choose between these sets because they all look great as completed models and will be used year after year for the Christmas display. Eventually I will probably buy them all, including the train. I love building Lego sets with my boys and this will give us some great time together during the festive season. Do you own any of these sets, or any others that you use for your Christmas display? Leave me a comment below and let us know your thoughts.